Edward Weston immigrated to the USA in 1870 and soon was involved in several ventures that included the electroplating business and later electrical lighting. He formed Weston Electrical Instrument Corporation in 1888 making it one of the early builders of meters and other electrical measuring instruments. Weston developed the first accurate portable current and voltage measuring meters and followed with watt meters. Eventually, Weston developed the first portable light meter. Weston also perfected the "standard cell" which was a 1.018638vdc mercury-cadmium battery used for calibration purposes. Daystrom bought out Weston in 1954. Analog Meter History - Most of what we take for granted in the suspension and accuracy of the modern analog meter was developed by Edward Weston. Electrical current flow indicating devices date to the early-nineteenth century. The "galvanometer" is a current indicating "meter" that relies on current flow through a coil suspended within a magnetic field to create mechanical movement of said coil. Movement was due to the opposing magnetic fields of the moving coil field and the magnet's field. The early galvanometers worked something like a compass and had to be oriented to the earth's magnetic field in order to have the indicator return to a zero-current position. By the mid-nineteenth century, magnets had replaced the earth's magnetic field as the return force and mirrors with light sources projected a moving light-beam onto a frosted glass scale. By 1882, Jacques d'Arsonval and Marcel Deprez (working independently) had improved the galvanometer to use a permanent magnet with a rotating coil within its field. Pivot points were two small wires top and bottom that suspended the coil within the magnet's field. The d'Arsonval meter movement was the basis for the modern analog meter using a moving coil. Weston substantially improved the d'Arsonval meter by adding coiled suspension springs to mechanically return the meter needle to zero and using pivots and bearings to reduce friction. Weston also improved the linearity of the meter by reducing clearance between the moving coil and the permanent magnet. With Weston's meter design having an improved magnet, better pivot bearings and accurate linearity, the meters could now be taken into the field and didn't require delicate handling, thus they were called "portable meters." Early-twentieth century DC Voltmeter coils tended to have rather high current requirements and the resulting load on the circuit being measured could compromise the accuracy of the measurement. The sensitivity of the meter was specified in "ohms per volt" and the lower the "ohms" the greater the circuit loading was. Generally, 1000 ohms per volt sensitivity was typical before WWII. In such a meter with 1000 ohms per volt, using a 300vdc FS could measure 300vdc and the meter would have an input load of 300K ohms and 1 mA would flow through the meter coil. Improvements in coils and more sensitive meter movements with higher resistances used in the voltage divider circuits reduced the loading and post-WWII meters with 20,000 ohms per volt became common. All "moving coil" analog meters use the current flowing through the coil, which is suspended in a magnetic field, to cause the coil and associated meter needle to rotate. With careful design and construction, this mechanical movement can be very linear and accurate. The point is that these meters respond to current. To measure voltage requires resistance to be added to the circuit and to then recalibrate the scale in volts. The resistance divider circuit allows a certain amount of current to flow through the meter coil (and the coil resistance is also part of the circuit) to achieve a full scale reading. The movement will be linear and therefore the scale can be produced to show voltage rather than the actual current that is causing the meter needle to move. Resistance can also be indicated by adding a small voltage from a battery and scaling resistors to have the meter's full scale indication represent the desired value in ohms. This was the basis for the Volt-Ohm Meter or VOM. 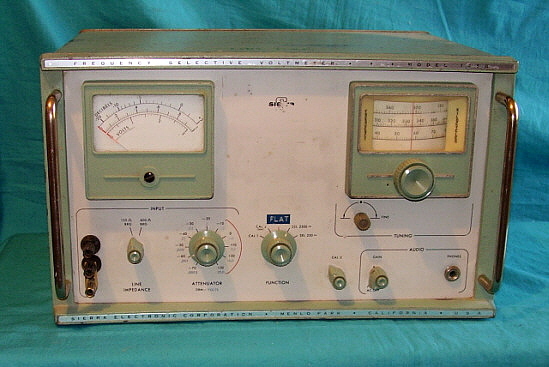 Shown in the photo above right is the Weston Model 540 DC Volt-Ammeter. This instrument was designed to set on the test bench or desk and provide the user with DC voltage measurements using three different scales - 3vdc FS, 15vdc FS and 150vdc FS. DC current could also be measured in three scales - .15 Adc FS, 1.5 Adc FS and 15 Adc FS. Meter sensitivity is 1000 ohms per volt. Terminals are binding posts. The meter can be closed up by folding the drop-down door up. Dates from the early-1930s. Shown in the photo left is the Weston Model 430 DC Volt Meter. This instrument measures DC voltage in three scales however individual binding posts are provided rather than a switch. The three scales are 3vdc FS, 15vdc FS and 150vdc FS. Meter sensitivity is 1000 ohms per volt. This meter dates from the mid-twenties. The basic design of the mirror galvanometer originated in 1826 by Johann Poggendorf but the improvements that made it a useable instrument came from William Thompson (Lord Kelvin) in 1858. The design has a coil with a small mirror mounted to it suspended within a magnetic field. Current flow through the coil will cause the coil and the mirror to rotate slightly. Several inches away a light source has a lens mounted in front of it and that lens focuses the light into a beam that is aimed at the mirror which reflects the beam to a semi-transparent scale some distance away. As the mirror rotates due to the current flow, the light beam is deflected and moves across the scale. Since the light beam had no mass (unlike a long indicator needle would) it could be used with large scales with tremendous resolution. These meter scales in such a system allowed incredibly small current flows to be seen since there was an apparent magnification due to projection of the light beam onto the scale. The further the distance from mirror to scale, the greater the apparent magnification and resulting sensitivity to minute current flows. Generally, the suspension of the coil-mirror was by a thin ribbon above and a coiled wire below. An early use of the mirror galvanometer was for testing underwater cables for wire telegraphy systems. It was also found that the mirror galvanometer (with minor modifications) could actually be used as the indicating device and "read" by the wire operators. Other uses were in various types of bridge resistance circuits where precision "null" indications were necessary for extreme accuracy. More modern versions of the mirror galvanometer will have the mirror-coil assembly in a small air chamber with a glass port for the light beam. This sealed housing prevents mechanical-physical interferences from deflecting the mirror during precise measurements. Most mirror galvanometers will have an external resistance across the input terminals to prevent damage to the suspension from mechanical shock or excessive inputs. The external R acts as a load on the coil and dampens its movement. Later applications use mirror galvanometers to direct laser beams for various purposes such as IC manufacturing, light shows and some types of medical instrument devices. This working Leeds & Northrup 2420-B shown to the right is from around 1940. The lamp operates on 6 volts. The resistor dampens the coil-mirror suspension when the galvanometer is not in use. The scale is "0" center and is +/- 20 millimeters. Generally, these instruments read in uA per mm or in uV per mm. Often used in Wheatstone bridge circuits where the galvanometer was a sensitive "null" indicator. Some mirror galvanometers have intense illumination that allows for projection of the light beam onto a large wall-mounted scale which is observed in a darkened room. The 2420-B however is intended to be used with the glass scale mounted at the front of the box. The L&N 2420-B Mirror Galvanometer is read by observing the etched glass scale noting the 20-0-20 scale. When illuminated, a bright "disk of light" is projected onto the scale with a shadow "arrow" and "index line" within. The reading is taken at the point where the "arrow" and "index line" is on the scale. Photo left is the interior of the 2420-B showing the horseshoe magnet, lamp and lens. Photo middle shows the mirror-coil assembly of the galvanometer. Photo right shows the lens and lamps assembly. Ray Triplett started in business in 1904 in Ohio. He was formerly trained in the watch business but built a small handheld electrical meter and called his company "Pocket Meter Co." In 1907 he coined the name "Readrite." The name was used extensively as Triplett developed and in 1932, the name was changed to Triplett Electrical Instrument Company. Triplett supplied panel meters along with other types of test equipment including tube testers. Triplett was purchased by LFG/api in 1997 and in 2007 Jewell Instrument LLC bought Triplett products and is still in business in Bluffton, Ohio. Prior to the hand-held digital multimeter, the standard for portable AC-DC voltage, current and DC resistance measurement was the VOM. These units were generally built into a fairly large bakelite case with a huge analog meter with a multitude of scales along with a multitude of selectable measurement ranges. In order to provide a method of measuring resistance a DC voltage was necessary and usually this voltage was provided by a small battery. Some models used two batteries due to the potential necessary to measure high resistances. Usually a 1.5vdc D cell was used for low resistances and a 30vdc "instrument" battery was used for the high resistances. Early DC voltmeters had a fairly high load on the circuit measured with 1000 ohms-per-volt being common. Later VOMs are usually 20,000 ohms-per-volt (on DCV) providing less circuit loading and more accurate measurements of circuits under test. Low impedance sources with high voltages such as power supply voltage levels, plate or screen voltages, etc. were generally not affected by the loading but trying to measure a high impedance low voltage source like grid voltages or very low current voltage-dividers could be a problem. The standard instruments were usually built by Triplett (630 Series) or by Simpson (260 Series.) Although today most technicians use a hand-held digital multimeter, sometimes these older analog VOMs can provide measurements of very high AC or DC voltages or high DC current that the modern instruments are incapable of. Shown to the below-left is the equally famous Simpson 260 VOM. It's difficult to say whether the Triplett 630 or the Simpson 260 was the most popular model of VOM. Certainly both models will be encountered often. This Simpson 260 belonged to Bently Nevada Corporation and it still has its BNC asset tag on the front of the meter. 20K on DC and 5K on AC. The Simpson 260 sold for $60. With VOMs encountered today, condition is always an issue because of the fragile nature of the bakelite case. Many of these models of VOMs will have broken (and sometimes repaired) cases - normally from being dropped or knocked-off of the bench. Excellent condition cases show that either the meter was well-taken-care-of,...or, it wasn't used very often. Meter movements can also be damaged. On VOMs without meter protection it's common to find bent pointers or open meter coils. Also, without the over-voltage protection, you may find some burned resistors in the VOM circuit. Leaving batteries in a VOM was common and nowadays those batteries probably will have started to leak their electrolytic. Leaking batteries can cause corrosion damage to the battery contacts and sometimes will leak onto other parts of the circuit causing corrosive damage. If the VOM found is in good physical condition with no case damage and a good meter movement then usually only minor clean-up and a new set of batteries will be needed. Many times it's necessary to measure operating circuits that are sensitive to how much of a load the measuring device adds to the circuit. The VOM, especially the older 1000 ohms-per-volt type, tended to load down a circuit under test and provide inaccurate measurements. Sometimes the load would stop the circuit from operating as in the case of some types of oscillators. The vacuum tube grid input impedance is very high and if it is used as an input stage to a voltage measuring circuit, the load added during measurement is very low - over 10 meg-ohms per volt. Thus circuits can be accurately measured without causing the operation to change. Most VTVMs would have an RF probe that would have a vacuum tube diode in the head of the probe. Necessary voltages were supplied via the cable and the signal would also travel up the cable. The RF probe allowed measuring very high frequency (RF) RMS voltages. The very low capacitance and high impedance of the vacuum tube input inside the probe head allowed for very high frequencies to be measured without being "loaded down" by long (high capacitance to ground) cable connections. Usually the VTVM needed to operate on the AC line voltage in order to have a power supply built-in to provide filament and DC plate voltages for the vacuum tubes. However, some manufacturers did make portable VTVM that were built into the same types of bakelite cases that the popular VOM used. It was necessary to use a tube that could operate on a rather small filament battery, generally one D-cell could operate a 1.5v filament tube. Also, usually two of the 30vdc instrument batteries were used in series to provide 60vdc plate voltage. The Triplett 631 (right) is a battery-operated VTVM and requires three internally mounted batteries for operation (sold for $75 in 1967.) The 631 is identical in size to the the 630 VOM. Internally, it's "crammed-full" of circuitry that includes the vacuum tube. The Measurements Model 62 VTVM is shown in the photo left (note the RF probe with 6H6 tube mounted to the rear of the case.) This VTVM is built into a slanting type of metal case that provides the user with an easily viewable meter. Push-buttons are used for range switching. FS ranges are 1, 3, 10, 30 and 100 volts. AC or DC voltages can be measured but the Measurements 62 will not measure resistance. Dates from the 1940s. The Simpson Model 303 VTVM is shown in the photo right. Although in a bakelite case, the 303 does operate on the AC line and features a stand that allows the meter to set at an angle that allows easy reading of the meter scale. The Model 303 is a fairly modern VTVM with the capability of measuring AC and DC voltages and resistance in ohms. Sold for $85 in 1967. These old analog VTVMs are still quite usable and are actually the best way to perform receiver alignments since it's so easy to observe the "peak" voltage while performing the adjustment. 1800-A - General Radio introduced the 1800-A Vacuum-Tube Voltmeter just after WWII (1946) for the hefty price of $345. The circuit uses 10 tubes which includes two neon glow lamps for regulators and a 3-4 Amperite ballast tube. Also, two type 9005 "acorn tubes" are used - one in the RF probe and one inside the instrument. The 1800-A would measure AC voltage with a frequency as high as 500mc. The RF probe is at the end of an eight foot cable and can be used directly connected to the source to be measured in which case there is slightly less capacitance allowing higher frequencies to be measured. One can also leave the RF probe "plugged in" to the internal connections under the top lid and use the front panel jacks for connections. Due to the higher capacitance of this type of connection, the measured frequency limits will be somewhat lower. DC voltages can be measured with a standard 10 meg ohm load to ground or with an "open grid" connection, which is "no load" on the grid of the input amplifier tube. This has to be done carefully to maintain accuracy due to variable loads affecting the grid to ground resistance. Most DC measurements are done with the standard 10 meg ohm load connected. Zero adjustment on the front panel is a "fine zero adjust" with the "coarse" adjustment located inside the unit. The mirrored scale allows for eliminating viewing parallax to increase accuracy. Additionally, the meter is illuminated with two lamps mounted in the lower part of the meter housing. Full scale voltage ranges are .05, 1.5, 5, 15, 50 and 150. The top two scales are linear and are for voltages above 5 volts AC or for DC measurement. The three lower scales are non-linear and are for voltages 5 volts AC and below. The 1800-A does not measure resistance, only AC and DC voltages. The top lid will open to reveal a storage area that contains a set of adapters for various kinds of GR connectors in addition to the RF probe. The carrying handle will fold back and allows the 1800-A to be on its back and slightly elevated to allow easy viewing of the meter. Serial number of the 1800-A shown is 1928 and it originally was used by the US Navy. "Property U.S.N." is stamped in red ink on the top of the lid. This 1800-A functions quite well and is an accurate instrument. 1800-B - General Radio made a few changes to the 1800-A VTVM and these new models were designated as the Type No. 1800-B. Introduced in 1956, the changes were minor. The "on-off" function was moved from the AC-DC selector switch to the Voltage Range switch. This allowed the AC-DC switch to then become the AC, +DC and -DC selector. With the 1800-A, the user had to change polarity by physically moving the DC connections at the +/- terminals. With the 1800-B this could be accomplished by merely changing the switch position. Also, the nomenclature was slightly altered to have "+DC" in red and "-DC" in silver. All specifications remained the same as the 1800-A. The same accessories were included and the basic appearance remained the same (although the lid-mounted licensing/use tag was eliminated for the 1800-B.) Selling price was $435 in 1959. The 1800-B was available from 1956 up to 1962. This 1800-B is also a functional unit. Its serial number is 4483. The photo to the left shows how the 1800-B (or A) can be angled using the carrying handle as a prop. Beautifully built, both the 1800-A and the 1800-B are accurate measuring tools and very reliable. Like most test equipment, many examples will have been subjected to endless applications of calibration stickers that nowadays seem to defy removal. Additionally, vibro-etching company asset-numbers into the front panels or meter cases seems to have been another popular method of defacement. The walnut cases can get pretty scratched up with years of use. Various types of oils or waxes will usually have the case looking acceptable again. Be careful with using oil-type furniture polishes as this seems to darken the walnut considerably. The darkening lasts until the wood dries out. I use a lightly-dampened cloth to clean the walnut finish as this removes the dust and dirt but doesn't darken the wood finish. The 1800-B photo to the left shows the normal color of the walnut finish that General Radio used. During the 1930s, McMurdo Silver was trying to run three companies simultaneously while also trying to entertain his various girl friends while driving around in his Packard convertible. Needless to say, McMurdo's only success was with McMurdo Silver Manufacturing Company located in Chicago. They produced high-end radios that were truly "custom-built" to order. Chrome chassis, large speakers, great audio and spectacular cabinets were McMurdo's trademark. That, and his fierce competition with Scott Radio Laboratory, the only other "custom built" high-end radio builder at the time. McMurdo eventually went out of business in 1938 (sold to Scott Radio Laboratories) but he formed another called McMurdo Silver Company located in Hartford, Connecticut and concentrated on small test equipment gadgets and other types of inexpensive devices. In 1947, McMurdo Silver was killed while cleaning an antique pistol. This is ironic since McMurdo had worked his way through college as an antique firearms dealer. The VOMAX is one of the better instruments that McMurdo produced after WWII. The RF probe plugs into a cubby hole in the front panel. The scales provided are AC or DC voltage 3, 12, 30, 120, 300 and 1200. DCR scales are 2K, 20K, 200K, 2M, 20M and an incredible 2000M (that's 2 billion ohms!) The db scale is 0 to 50db into 600Z ohms and the current measurements are 1.2mA up to 12 Amps. The RF probe can be installed as shown for low frequency RMS measurements but for high frequency RMS measurements the RF probe can be unplugged from the cubby and used directly. The 410B is probably the most popular of Hewlett Packard's early VTVM instruments. They are easy to find, usually are in good condition and normally not too expensive. Versatile, accurate and easy to maintain, the 410B is a good choice for a vintage "bench-type" VTVM. Test leads are permanently connected to a plug-in cable assembly that fits under and just behind the front panel. The RF probe allows measuring RMS voltages up to 700mc or so. The 410B has six ranges of voltages for both AC and DC measurement, 1, 3, 10, 30, 100 and 300 volts FS. Resistance can be measured from .5 ohms up to 500M ohms. Six tubes are used in the 410B, (2) 12AU7, (1) 6X4, (1) 0B2, (1) 6-4 Amperite ballast tube and the RF diode inside the RF probe is a 2-01C. A three-wire power cord is used and the case is metal that is painted HP tan and the front panel is gray. A rear door can be opened to access a storage area. Accuracy is 3% on voltage measurement but varies with frequency on RMS measurements and with other factors for resistance measurements. Like a lot of popular equipment that was used in the industry, it's sometimes difficult to find a 410B that hasn't had dozens of calibration stickers applied to the front panel and many also will have asset tags or numbers engraved or worse. Luckily, this 410B belonged to Al Chin who worked on the Reno Police Department radio equipment so it only has "Test" in red paint on the top of the cabinet. I also have a second HP 410B that belonged to the USAF that is a more typical example with lots of stickers and decals. Both are functional and useable VTVMs. The Signal Corps wanted a "beefed up" version of the HP 410B and the result was the ME-26. Although its appearance is quite different from the 410B, it's the same circuit and components. The initial ME-26 versions were nearly identical to the HP 410B in appearance. Later, other contractors built the ME-26s and the appearance was changed as noted by the look of the ME-26D/U shown to the left. The contractor for this particular ME-26D was Sentinel Electronics. This is a working ME-26D/U and it's an excellent VTVM, very stable and accurate enough for alignments or measuring AC signal voltages. The 400C is from mid-to-late forties. The 400D is from the fifties to sixties. The scales provided on the 400C or 400D are a match for the attenuator scales used on the HP 606 signal generators and provides the user with the capability of measuring RMS voltages down to a scale of .001 vrms FS. These meters can be used anywhere that the RMS value of an AC signal needs to be measured or adjusted for highest value. This 400D was used at Bently Nevada Corp. in Minden, Nevada for years. It still has the asset tag on the front panel. Note that this meter was routinely maintained by the BNC Metrology Lab and during one such routing the Output red binding post was replaced. BNC would send unused equipment to the "inactive stockroom" where it could be purchased by employees. The Audio Frequency Output Voltmeters shown are handy, useful little instruments, especially for receiver alignment. The meter is connected across the speaker voice coil connections where it measures the audio output level of the receiver. For alignment purposes the signal generator must provide a modulated waveform and usually 400 hz is the standard (1000 hz is also a standard.) Best results will be with the receiver's AVC off and the audio output level controlled with either the signal generator level or the audio gain control of the receiver If the output is measured directly at the plate of the output tube then the connection must be to COND. which places a 0.1uf capacitor in series with the meter. +/- is common and 2, 10 and 50 are the full scale voltage levels. 2 is the most useful for voice coil measurements. Both the Weston 687 and the Simpson 427 are nearly identical in design, use and performance. Wave Analyzers are frequency tuned voltmeters that were generally used for measuring RF noise or RF interference on telephone lines, cable runs, data lines, etc. - anywhere that signals of some sort were routed down a cable and might be susceptible to interference from leakage or other problems. Most Wave Analyzers will tune from a very low frequency up to a few megahertz. Many will have features like a radio receiver, i.e., selectable sideband detection, BFO and an audio output that is accessible - usually a phone jack for a monitoring headset. What they won't have is AVC since the whole point is to measure the interfering signal's level without any control circuitry. Many Wave Analyzers used analog tuners but some were mechanical digital and more modern versions are all digital. Since the Wave Analyzer or Selective Volt Meter is essentially a radio receiver, it's possible to connect an antenna to the input and use the instrument as a LF receiver using the audio output monitoring to drive a set of headphones or loudspeaker (Z matching may be required.) Some versions work quite well in this application. Others don't. Shown in the photo right is the Hewlett-Packard 310 Wave Analyzer - the HP-310 is an excellent performer as a VLF/LF/MF receiver because it tunes from 1 khz to 1500 khz, has a BFO, selectable modes (AM, USB, LSB) and has a mechanical digital frequency readout. It is easy to over-drive the output because there is no AVC but usually, if the noise is low, it can be operated on the highest sensitivity without any problems. In higher noise conditions, the second highest sensitivity must be used. Sensitivity is controlled by the setting of the FS meter level - lowest FS level = greatest sensitivity. The Sierra Model 125B was used for the same purposes that the HP Wave Analyzers were. Sierra was a common brand used by many different telephone companies. The 125B is a vacuum tube unit and is fairly well built. However, its usefulness as a LF receiver is limited. Although it does pick up signals when an antenna is connected to the input, those signals are difficult to hear because the 125B lacks a BFO. Without a BFO, it is very difficult to hear the carriers of MCW signals, such as Non-Directional Beacons. Virtually all signals in the MF, LF and VLF ranges are data type signals (no voice) and without a BFO, most of these signals will go unnoticed when tuning the 125B. The tuning range on the 125B is from 1hz up to 620khz. The invention of a resistance bridge circuit to measure an unknown resistance is credited to Samuel H. Christie in 1833 but the instrument's name, the Wheatstone Bridge, is credited to Sir Charles Wheatstone who popularized the circuit in 1843. The Wheatstone Bridge could measure an unknown resistance by substituting the unknown R into a "bridge circuit" consisting of two series-parallel R branches made up of four resistances (including the unknown and one fixed-value R in one series branch and the adjustable R and another fixed-value R in the other series branch with both fixed-value resistors of equal value.) A source of DC potential was connected to each end of the series-parallel R branches (+ to one end and - to the other end.) Then a sensitive "zero-center" galvanometer was connected between the two series-parallel branches at the series junction of each of the resistors pairs. The galvanometer would indicate a "null" (zero-center) when the "unknown R" was equal to the adjustable R since equal current flowed in both series branches. Before long, it was discovered that not only DC resistance could be measured but capacitive or inductive reactance could also be measured if an AC signal was substituted for the DC voltage in the Wheatstone Bridge. By using an oscillator to provide the AC signal (generally at one specific frequency) values of unknown capacitance and inductance reactance could be measured and from that Xc or Xl measurement the actual component value could be calculated. Prior to vacuum tube oscillators, mechanical buzzers and "hummers" were used as an AC source. Shown to the top right is a Leeds & Northrup Wheatstone Bridge. There are binding posts for connection of a DC potential labled "BAT" with + and - posts. Also posts for the Galvanometer connection and for the "unknown" R value. Push switches are provided to connect the battery or the galvanometer. The decade switches allow the user to select the value of R that is in series with the fixed R. Internally the two fixed R values are comprised of a center tapped R that provides the two equal fixed R values. When the user sets the switches he watches the galvanometer and when it shows zero, the unknown value is equal to the value shown on the selected switches. The level of DC applied is not important but as the value of the unknown R becomes higher more potential might be necessary to see significant movement of the galvanometer and thus see a good null indication. With a DC potential connected, only values of R can be measured. If an AC voltage is applied then the user must know its exact frequency so the proper calculation can be made to convert the reactance value to the component value. However the galvanometer will not function on AC so usually a headset is connected and an auditory null is used. Note that the Gray Instrument bridge (bottom right) shows "TEL GA" indicating either a galvanometer or telephones connection to these binding posts. Today, most of the uses of the Wheatstone bridge are in physics classrooms or laboratories in colleges or universities where they are used to demonstrate the principles of the bridge circuit. It's a good exercise to go through the procedure and see how measurements were made when there were no digital readouts, hand-held calculators or even direct ways to measure values of R, C and L.
Both of these Wheatstone Bridges came from St. Martin's University in Lacey, Washington. Note that the Gray Inst. Co. bridge has "St. Martin's Colle" hand engraved on the panel. Also the hand-written notes regarding the accuracy of the bridge resistors were written on white paint that was then covered with Scotch Tape. Note that with both bridges that the layout of controls and binding posts are exactly the same - that is - standard for Wheatstone Bridges. This test box is an example of the type of "industrial" test equipment that Leeds & Northrup built. It's also an example of how the test equipment that was used in those types of environments is usually found nowadays in "well-worn" condition. Note that the numbered skirts on the R knobs have most of the numerals worn off right down to the celluloid base material. Also, the instruction card in the lid is virtually unreadable due to wear from having the test leads kept wrapped-up on the panel and then forcing the lid closed. This Cable Testing Set is essentially a DC Resistance Bridge that incorporates a built-in galvanometer and enough switches to create different types of loop circuits to find faults within a run of cable. Both opens and shorts can be located with the test set. With a short-circuit within a multi-conductor cable it would have been possible to measure the resistance from the test set to the short-circuit (and back.) This could then be correlated to the actual distance to the short-circuit by comparing the resistance per foot for the size and material of the conductors within the cable to the measured resistance. An external battery was required for testing. This Cable Testing Set has a serial number of 84070 which dates it to the early 1920s. The Wheatstone Bridge could not only measure an unknown R value, if an AC voltage was applied to the bridge circuit, capacitive or inductive reactance could be measured. From the Xc or Xl, the actual unknown value of the component could be calculated. Since reactance is what is actually being measured, this application of the bridge was usually called an "Impedance Bridge." Early Impedance Bridges used mechanical oscillators that were something like buzzers and would work with a DC voltage, creating an oscillating voltage. Early Bridges used separate devices to connect a voltage source to separate resistive components and to the galvanometer to complete the bridge circuit. By the early twentieth century, Bridges were available as a complete test instrument although most required separate potential source and galvanometer. Later Impedance Bridges would have all components built-in with an AC line operated power supply for the potential source for DCR measurements and a built-in electron tube oscillator for Z measurements. Shown to the right is the General Radio Company Type 650-A Impedance Bridge. When battery operated, a mechanical oscillator called a "hummer" was used. This device used the battery supplied DC voltage to cause a small pendulum to mechanically vibrate and that was picked-up by a carbon microphone inside the unit. The output was sufficient to drive a hi-Z headset. Early versions were battery only operation but in the late-forties, the 650-PI was introduced. The Type 650-PI eliminated the need for the hummer and an electron tube oscillator (1kc) was used in its place. The amplifier gave higher output levels for better detection of the null by listening to the headset. Most of the voltages provided by the 650-PI are for its oscillator and amplifier. The DC voltage provided for the DCR measurements is a substantially higher (~180vdc) than that provided with battery operation. This results in better accuracy at higher resistances. The 650-A shown to the right has the 650-PI installed. The solid walnut case is lined with copper sheet for full shielding. Selling price in the early fifties was $410 with the 650-PI installed and $260 if the battery operated version was desired. The 650-PI by itself was available for $150. photo above: This is a late production 650-A showing that these impedance bridges will sport black dials in place of the earlier silver dials. The serial number on this particular 650-A is SN: 12030 and it probably dates from the mid-to-late-1950s just before the introduction of General Radio's new 1650-A impedance bridge (1959.) Using the General Radio Type 650-A - To measure DCR only requires that a small DC voltage be applied to the bridge - use the 650-PI with DC selected and the output connected to EXT IN on the bridge. An unknown resistance can then be connected to the "R" binding posts on the bridge. The galvanometer is switched to "Shunted Galv" before the unit is turned on. This protects the galvanometer from being "pegged" to full scale. R is selected with DQ scale switch and the bridge power supply switched on. Select a position with the range switch that moves the galvanometer needle to near the center with the C-L-R dial set to 1.0. Now, tune the C-L-R dial for a zero indication on the galvanometer. Next, switch the Shunted Galv to Galv which removes the shunt for better meter sensitivity. Now retune the C-L-R for zero on the meter. The DC resistance is read on the C-L-R dial times whatever multiplier is selected by the range switch. The galvanometer is only used for DCR measurements. Accuracy is about 1% to 2%. AC resistance can also be measured using the 1kc oscillator rather than the DC voltage. Measuring C and L is accomplished with the 1kc sine wave input from the 650-PI unit connected to the EXT IN on the bridge. An unknown C or L is connected to the "CL" binding posts. For C measurements set the DQ dial to 0 and for L measurements set the DQ dial to 10. Select C or L measurements with the DQ scale switch. Connect a hi-Z headset to the "phones" binding posts on the 650-PI unit. Turn on the 650-PI. A 1kc oscillation will be heard in the phones. Adjust Oscillator Gain and Audio Output Gain for a relatively strong 1kc signal as heard in the phones. Then adjust the C or L range switch for the quietest oscillation note as heard in the phones. Now adjust the C-L-R dial for the best null (quietest signal in the phones.) Adjust the DQ dial for a further null and re-tune C-L-R for an even better null. If "Q" is selected (with the DQ scale switch,) then the Q dial can also be adjusted for L and adjust for a null. Select "D" for capacitance dissipation. Use the appropriate multipliers when Q or D is selected. Value of C or L is read on the C-L-R dial with the appropriate multipliers used. If the actual impedance value (Xc or Xl reactance) was desired for some reason it must be calculated from the component value measured with f = 1kc. Overall accuracy is about 2% for value and about 10% for Q or D. Better accuracy is attainable with short, low R test leads. Same is true with DCR measurements. Be sure to check the calibration of your GR 650-A for best accuracy. The manual specifies that another R bridge must be used for adequate calibration accuracy however a modern digital multimeter in ohms will be just as accurate for calibration. photo above: Upper slide rule is a Pickett Model N902-ES (Simplex Trig) from the mid-1960s. This slide rule is aluminum that is painted yellow which was supposed to be "easy on the eyes" after hours of calculations. Below is the Keuffel & Esser Co. Model N4053-3 "Polyphase" from the mid-1930s. This slide rule is mahogany with white plastic scales. Also, two ruler scales on top and bottom edges. photo above: This "Circular" slide rule, made by Concise for Motorola, was a very small "space saver" that easily fit in your shirt pocket. Concise was a Japanese company located in Tokyo. The circular slide rule was made famous by Peter Sellers in the movie "Dr. Strangelove." By the mid-1950s, the old GR 650-A Impedance Bridge was beginning to show its age and really looked like a relic from the 1930s. The 650-A was a large, heavy instrument that was sort of difficult to move around and, if left set-up, took up a lot of bench space. Around 1959, General Radio announced their new replacement for the venerable 650-A, the very modern Type 1650-A Impedance Bridge. Price in 1959 was $440. The new 1650-A was in a metal cabinet that was half the size of the old 650-A. Additionally, the very cleverly designed lid remained attached and could be swung-around the cabinet and would provide a base for the cabinet that would allow any viewing angle that was convenient for the user. When transporting the bridge around, the lid could be swung back and locked into place providing panel protection and a carrying handle to allow easy moving of the unit. By the introduction of the 1650-A, General Radio was beginning to change the old black crackle finish panels and was now using dark gray crackle finish along with gray knobs. The internal 1.0 kc oscillator was "fully transistorized" as was the detector. This allowed the 1650-A to run entirely on 6vdc which is provided by four D-cells. If necessary, an external power supply could also be used. The batteries load into a cylindrical opening on the top of the cabinet with the retainer cap being the negative connection. At the time (1950s-70s,) batteries were prone to leakage if left installed a unit that was going to be stored for lengthy time periods. Be sure to check the condition of the battery compartment on any 1650-A you intend to purchase. Some 1650-As will be found with corrosive damage where the batteries were left installed over a long period of time. Modern batteries are much less prone to rupturing but still they should be removed when the unit is not in use for long periods of time. The 1650-A is a very easy Z bridge to use, especially when compared to its older brother, the 650-A. All component values seem to just "dial right in" and the DQ dial action provides "easy to see" nulls. Since the NULL meter has an amplifier circuit and also has adjustable sensitivity, excellent "null action" results and headphones are not necessary for AC measurements. Twin-T describes the particular type of "bridge" circuit that the 821-A uses. The advantage of the Twin-T is that it allows a common ground to be used between the generator and the detector providing interconnections to the "unknown value" via coaxial cable. This allows high frequency measurements of capacitance, inductance, C dissipation factors, Q of coils, Z of coaxial cable runs, antenna-transmission line Z, resonant Z of parallel tuned circuits and Z matching networks to be made accurately. An external fixed value capacitor is required for some types of measurements. Additionally, usually some mathematical calculations are required to determine many of the final measurements. An external "generator" source is required and this can be a laboratory RF signal generator that provides frequencies from 460kc up to 40mc with an adjustable output level. An external "detector" (null detector) is also required and this can be a communication receiver that tunes within the frequency range required. The receiver should have a manual RF gain control and also have the ability to remove any AVC control of the signal. The receiver should also have a BFO (required for some set-ups.) The 821-A was supplied with two coaxial cables for interconnecting of the RF generator and the receiver to the Twin-T circuit. GR-874 connectors were used for the generator and detector connections to the 821-A. All circuitry within the 821-A is passive and all signal source and null detection are external to the 821-A. The selling price in 1951 was $520. The photo to the left is from General Radio Catalog M (1951.) It shows a laboratory engineer measuring an inductance using a Type 821-A Twin-T Impedance Bridge like the one shown above. 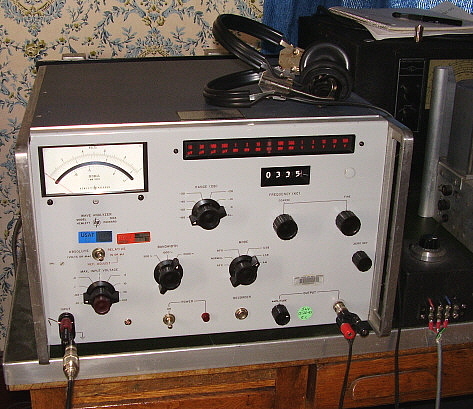 The signal generator shown is the GR Type 1330-A Bridge Oscillator. The communication receiver shown is a National Company NC-173. General Radio Company catalogs were first class books that not only showed the company's product but also included detailed write-ups on theory of measurement and use of the various types of bridges or oscillators and an abundance of other information including charts, tables and graphs to assist any user of GR equipment. The catalogs always had great photos and artwork and printing was always on high-class "slick" paper. Catalogs were assigned letters that were published chronologically but each catalog was considered current for about two years. Catalog M is dated October 1951. I also have Catalogs N, P and R ranging from1952 up to 1959. Boonton Radio Corporation was formed in 1934 by William Loughlin and C. L. Franks, both from Radio Frequency Laboratories. Franks had developed an instrument to measure inductance along other coil parameters and this became the first Q-Meter which was Booton's first product. Later, although Boonton made other types of test instruments, they were primarily known for their Q-Meter. Boonton's first Q-Meter was the 1935 Type 100-A. By 1941, the Type 160-A was in production. In 1953, the Type 260-A was introduced. The 260-A was in production from 1953 to 1970. Hewlett-Packard bought out Boonton in 1959 but continued the production of the 260-A. Note that the Type 260-A shown to the right has original H-P type knobs installed. The Type-260 has a tunable oscillator and a calibrated variable capacitor allowing the user to measure resonant frequency of a prototype LC circuit using an unknown L with the internal tunable C and the variable oscillator. The Q of the L can also be measured. With known value L installed, an unknown C can be determined by the resonant f of the LC. A coil must be installed in the Type 260-A for the oscillator to work. Original selling price of the Type 260-A was $725. Boonton Radio Corporation was known for their Q-Meters. However, Hewlett-Packard bought Boonton in 1959. H-P still continued to have Boonton produce the Type 260-A for quite some time. Move ahead into the 1970s or so and you have the all solid-state HP 4342A Q-Meter. It accomplishes the same functions of determining unknown values of L or C in addition to measuring the Q of the particular resonant circuit under test. Since the oscillator can be tuned, resonate frequency of an LC combination can be measured. You can also "tune in" different values of L or C in an "prototype" LC circuit (minus either L or C) and find the resonate frequency. The GR 1612-AL was a device for measuring low value capacitance at a radio frequency of 1.0 megacycles. It employed a vacuum tube oscillator using a 117N7 which also provided the rectifier function for the power supply. To power the RF Capacitance Meter required 115vac. The circuit used a substitution method that required the user to "zero" the circuit and then connect the capacitor to be tested to the terminals marked "X." Then the large dial "uuf" was adjusted to rebalance the circuit and the capacitor value then read directly on the "uuf" dial scale. Note that "micro micro farads" are used which dates the 1612-AL to the late forties. By the mid-fifties, "pico farads" or "pf" had replaced the "uuf" term. The 1612-AL sold for $170 in 1951. This RF Capacitance Meter came from W6AQU. Capacitors are difficult to test since they require an AC signal to actually tell anything about their performance - other than if they are shorted. Capacitor analyzers generally allow the user to apply full working voltage to a capacitor to see if the dielectric can handle full voltage and to measure the current leakage of the capacitor. Then an AC voltage is used to measure the capacitance based on the 60hz line frequency and Xc at that frequency. Power factor (used more in AC circuits where the capacitor must be able to transfer power,...like motor starting capacitors or balancing L loads in distribution lines) can usually also be measured. Solar Manufacturing Corp. was a major capacitor supplier during the forties, fifties and sixties so it seems logical that they should produce an instrument for checking capacitors. There are several different versions with the main difference being whether a meter is used for measurement or whether a cathode-ray tuning eye tube is used. Other manufacturers built capacitor checkers and kits were also available from Heathkit and EICO. Today, the hand-held digital capacitance checker is popular but these will only measure the capacitance value at a very low voltage. For vacuum tube equipment, there are a few other things that should be checked on a capacitor (like leakage current) before applying high voltage and these vintage capacitor analyzer units, when fully rebuilt, can provide those checks. This is another piece of test equipment from McMurdo Silver Company, the post-WWII company that Silver started in Hartford, CT. After his run of building high-end, custom radios in the thirties, Silver stayed out of that market post-WWII and concentrated on small and inexpensive test equipment and ham radio devices. The Model 904 is a Capacitance or Resistance Bridge allowing the user to measure values of capacitors and resistors. The pin jacks allow for connection of a null meter for more accurate measurements. A set of headphones could be substituted for the null indicator. Voltage levels are adjustable and leakage can be seen on the eye-tube. Non-Linear Systems, Inc. was started by Andrew Kay in 1952. The original location was in Del Mar, California but later the company moved to San Diego. NLS is credited with creating the first digital voltmeter in 1954. Later, in the 1980s, Kay started Kaypro to produce home computers. Kay died in 2014 at the age of 95. NLS is still in business in San Diego. This isn't the "first" digital voltmeter from NLS but it's an early one that uses vacuum tubes and incandescent lamps (probably dates from the late-fifties.) The 451 uses various analog comparator circuits to create a "selector circuit" that operates stepper-motors that search for a "null" and when the stepper-motors stop the circuit will turn on one of ten incandescent lamps that are arranged above each of the four Digit Assemblies. Each Digit Assembly consists of ten plastic pieces with numbers engraved into the plastic that are stacked "front to back." When one plastic piece is "edge lighted" the engraved number appears to "glow." There are four levels of ten numbers each allowing the voltmeter to readout the input voltage "+/-0000" as a "digital" display. Note in the photograph to the right that the numerals appear to have depth running from front to back. There are 43 lamps total used in the digital display. The incandescent lamps are spring-loaded within their holders in the Digit Assembly which is held in place with the lamps contacting the printed circuit board pads. The lamps are "wheat-germ" types similar to the #328 lamps used in the R-390A receiver. The entire upper part of the 451 chassis is a horizontally-mounted circuit board that has downward facing sockets that hold the stepper-motor driver boards. The entire area is sealed with foam rubber pads for sound-proofing of the stepper-motor action. The noise created by the stepper-motors resulted in these NLS DVM being referred to as the "box of snakes." In the lower portion of the 451 is the power supply and the stepper-motor chopper circuitry. Input to the 451 is via screw terminals located on the rear of the chassis. A cable from the terminals is then routed out through the back panel and then to whatever was going to be measured. The Calibrate switch on the front panel is spring-loaded and, when held in position, the pot located behind the hole in the panel above the switch was adjusted so the display read whatever was written into the blank portion of the label. Currently, the Model 451 has not been restored. It was given to me by my old radio collector friend Fred Winkler around 1988. At the time, Non-Linear Systems offered a data packet on the Model 451, which I ordered. To my surprise when the packet arrived I found that Non-Linear Systems had apparently reassigned the same "451" number to a modern small panel-mount digital voltmeter. I've never been able to find any info on this early NLS Model 451. This is an early digital frequency counter that doesn't provide the user with actual "numbers" in the readout. Instead the Nixie tube displays, called dekatrons, are a series of ten "dots" that are arranged like a "clock face" As the counter is sampling the frequency the "dots" appear to "spin" around the clock until sampling is completed at which time the "dots" lock in the finished position. The user then has to read each digit somewhat like a "clock face." The Westport Electric counter is for low frequency applications as it's maximum readout is 9999 Hz. Probably dates from the late-1950s. In this close-up photo the WE-140 is shown in self-test. If it were actually reading an input frequency it would be 9993 hz. Note that the "units" and "tens" dekatrons appear to be a lighter color than the "100s" and 1000s." This is because a "faster" dekatron is used in the "units" and "tens" position since these "dots" do change rapidly. The "faster" dekatrons used a slight amount of hydrogen mixed with the neon to "speed up" the response. Back when vacuum tubes dominated the electronic industry and designing or testing a vacuum tube prototype device required some "real juice," there were power supplies available to perform the task. Lambda Electronics Corporation can be traced back to around 1948 building high-quality power supplies for various uses. Several mergers over the years resulted in the company being called Nemic-Lambda beginning in the late seventies and with the latest merger (in 2008) being called TDK-Lambda. The Lambda Model 25 is an adjustable B and fixed A power supply. The B+ is regulated and adjustable from +200vdc up to +325vdc at 100mA. The A supply is 6.3vac at 3A. This type of power supply can power up a 8 or 9 tube receiver. The National HRO, for instance, requires 6.3vac at 3A and +230vac at 70mA. The Lambda 25 can provide this with ease and additionally, the B+ is regulated where the original National B+ power supply wasn't. Also, these types of supplies are ideal for reforming electrolytic capacitors. A separate current meter will be necessary along with some method to limit current as a safety measure. The Lambda 25 was available in either a table model or in a rack mount configuration (Model 28.) The table model is shown. HP-712B Power Supply - The H-P 712B is the ultimate in a vacuum tube-based, adjustable B+ and fixed high-current A+ and adjustable C- bias supply. The 712B is massive with plenty of current capability in the B+ which can be adjusted from 0 to +500vdc. Current available is 200mA. The A supply is 6.3vac at 10A and the C- bias supply is adjustable from 0 up to -150vdc at 30mA along with a fixed -300vac at 3mA. A variac on the primary of the B+ transformer is how the B+ voltage output is adjusted using the large knob between the meters. Regulation is by way of four 6L6GB tubes. The 712B was available in either a cabinet table model or in the rack mount configuration. The rack mount version is shown in the photos below. This 712B is awaiting restoration. As can be seen by the photo to the lower right, the 712B was stored for decades in a garage where all kinds of dirt, dust, insects and other contaminates drifted down through the holes in the top cover (this HP 712B came from the same place as the Tektronix Type 561B oscilloscope profiled in a section above.) Sometimes this type of dirt can have a protecting effect leaving the metal finish underneath in perfect condition. Fortunately, that is the case with this 712B (yes, I have cleaned the chassis since the photo.) Also, since this type of equipment was used in test facilities where the operator or calibration tech wasn't the owner, sticker residue and acceptance stamps are all over the front panel. Sometimes these can be removed but often times it's better to just leave the residue alone since removal will probably damage the panel paint. At least this piece of test gear wasn't "plugged in and turned on to see if it worked." Variac - General Radio Co., Powerstat - Superior Electric Co. The ability to adjust the AC line voltage has several advantages and the device needed to accomplish this is the Variac. Sometimes referred to as a Powerstat, which is actually the product name from Superior Electric Company (now owned by Danaher Corporation who also owns Tektronix) or officially as a Variable Voltage Transformer (and sometimes as an adjustable auto-transformer.) These are all various names for the same device that we'll call a variac. Variacs come in many sizes from very small panel mounted types for adjusting AC voltage for a specific function in an electronic circuit up to very large variacs for adjusting the AC line voltage to power large pieces of equipment. Variacs are available for single phase AC or three-phase AC. You can get variacs that are "stacked" for simultaneously adjusting more than one AC output. Variacs can be wired to output voltages higher than the line voltage. Whenever the requirement is to adjust the level of the AC line voltage or to bring the level of the AC line voltage up slowly, a variac is the device that's normally employed. The variac's winding is connected across the AC line with Neutral at one end and Line (Hot) usually at the next to the last tap. The output is taken from an adjustable contacting rotor arm that uses carbon brushes to make contact against the individual turns of the main winding. The return end of the output is referenced to the Neutral end of the main winding. Due to transformer action it is possible to actually adjust the rotor to gain more voltage than the AC line depending on where the Line is connected on the winding - next to the last tap for "higher than AC line output" is typical. With 120vac to the main winding you can usually adjust the rotor to achieve about 140vac maximum output. Ratings are usually in amps or KVA and the average test-bench variac is typically rated at about 10 amps. When using a variac there are a couple of important things to remember. First, there is no isolation from the AC line when using a variac. If it's necessary to have the device you're powering (and testing) isolated from the line then you'll have to use an Isolation Transformer between the variac and the device under test. Second, never switch the variac ON with a load with the rotor adjusted to any level other than zero volts. Always start with the variac set to zero, then switch on the AC and then adjust the variac rotor to the AC voltage level that's needed. When powering down the variac, again return the rotor to zero before switching off the AC input voltage to the variac. Full voltage switching with a load connected (either ON or OFF) will cause burn spots on the surface of the windings and will eventually cause damage to the brushes and winding surface. Shown in the photo right is a later style (early fifties) General Radio variac, the Type V 20M which is rated at 20 amps. The 1951 GR selling price was $55. I purchased this V 20M from Bently Nevada's inactive stock. When I was working a Bently Nevada Corporation (1973 to 1997,) from time to time I would purchase various types of used equipment that was in "inactive stores." This was fairly easy to accomplish only requiring some paperwork and payment. Things began to change in the early 1990s when all employee purchases then had to go thru the Purchasing Department. About that time, I spotted an old 1940s General Radio 100-Q 18 Amp Variac over in "inactive stock." When I asked the Purchasing Dept about buying the GR Variac I was told, "We'll have to look at what those are selling for in the catalog." To which I replied, "Good luck, that variac is from the late-1940s. It won't be in any current GenRad catalogs." The purchaser then said, "Well, then we'll have to find something like it and see what the current replacement cost would be." I could see this purchaser thought a 50 year old variac had no depreciation so I gave up trying to buy it. Six months later I was looking around out in the back "scrap yard" and I saw the very same GR Variac "tossed" in a large metal 55 gallon oil drum (filled with pieces of scrap aluminum and other metal parts) ready to go to Reno Salvage. What a waste, but that's bureaucracies, I guess.